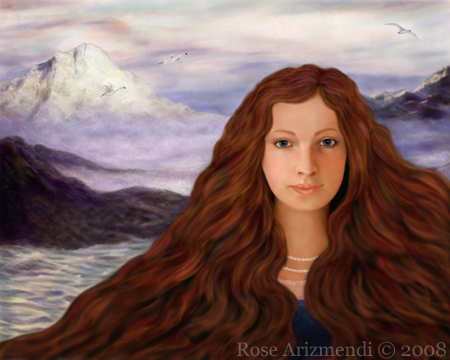 The Swan Maiden painting is almost finished, but I have a few more details I want to add to it. I have been working on this painting off and on since February of this year and promised myself it would be finished by January 2009. 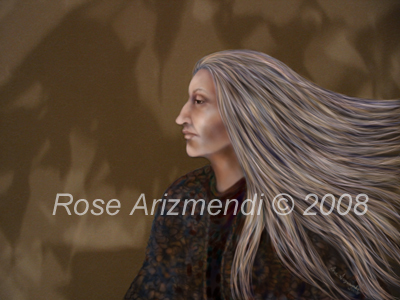 This painting was loosely inspired by the Irish legend of the beautiful Swan Maiden “Caer Ibormeith”. She was the daughter Of Prince Ethal Anbuail of Sid Uamuin in Connacht. Legend has it that every other Samhain she would change into a swan and would remain in this form for a year before becoming human again the following Samhain. Visit the post on June 17th for more info. Some solace there to find. And wept for the lonely world. A swan with a golden chain. That it put my heart at peace. But she had swum away. I spent this evening working on this digital collage. For the background I used an image that I created a while back and added some detail with ink and pastels. 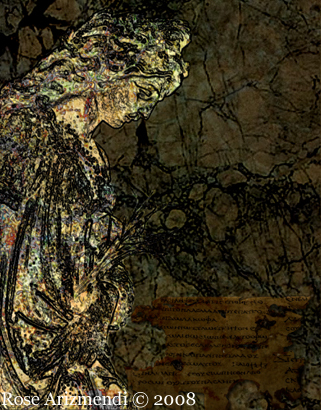 Next I digitally enhanced the image of an angel statue and layered pastel and ink details over three separate images and then merged them together. This collage was created with Painter IX and Photoshop. Creative playtime is often one of the most important activities we can engage in as artists. I believe taking the time to play with new ideas, new mediums and color palettes, keeps us in touch with our creative child. After all, our child just wants to have some fun. Taking risks and experimenting is key to our growth and makes us feel alive, and rejuvenated. We all know that it’s fun to create and make things, and yet we tend to go straight from the idea to the finished painting, without giving ourselves some precious creative goofing around time in the studio. You know what I mean, maybe your a water-colorist or oil painter, and those pastels you bought way back when, has never been opened . The time for trying something new is now, for later seems to never come. Go ahead, give yourself permission to goof around with something you have always wanted to try, but never did. Just Breathe, let go, and flow! This morning I awoke to a calliope of sound coming from our front yard. As I peered out our bedroom window to see what all the ruckus was about, I saw a dozen or so American Crows perched on our sycamore trees. Above the trees a small hawk was being chased by some rather angry crows. To say the least, the crows were very upset. Over the years I have learned to pay attention whenever I hear crows making a scene, and without question there’s usually something out of the norm happening. Finally after 20 minutes or so everything returned to normal, and peace & quiet returned to our sleepy little neighborhood. The common American crow is one of the most intelligent of all birds. It is one of only a few species of bird that has been observed modifying and using tools to obtain food. It can communicate warning, threat, taunting, and cheer to other crows by varying the “caw” sound it makes. Its cries of warning are specific enough that some animals other than crows are also able to use them as signals of dangerous predators. The Tibetans believe the crow so sacred that watching their actions can predict an outcome in your life. The Lenape Indians of Delaware also believed in a Many Colored Crow or Rainbow Crow who selflessly brought fire to all the woodland creatures and he is black from burning himself on the trip. 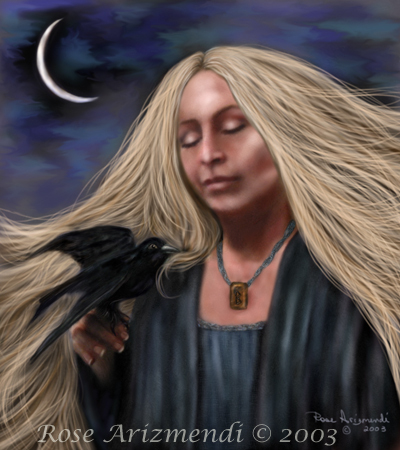 Many of the Celtic goddesses were linked with the crow or raven; Badb, Macha, Nemain, Nantosuelta, and Tethra. We had a beautiful sunshine filled day and I took advantage of the great weather by going for a walk. Our dog Rupert really enjoyed himself as he sniffed every plant on the block, and I noticed everyone we encountered on our walk seemed to have a little spring in their step, including us. I spent most of the afternoon working on the painting below, and wanted to share it with you. It’s almost ready to be posted on the gallery site, I just need to tweak it a little more .